New research shines the spotlight on a new plastic pollution menace -- microfibers. By 2050, the World Economic Forum predicts that the amount of plastic in the oceans will outweigh ALL the fish. When you hear “plastic” pollution, you might picture six-pack rings wrapped around seagulls or beaches littered with plastic bottles. But now, researchers are discovering a new menace -- microfibers. They’re tiny strands of synthetic fibers. Approximately 60% of the clothing we wear consists of synthetic fibers made from plastic including acrylic, nylon, and polyester. These ubiquitous fibers are used in everything from moisture-wicking athletic pants to insulated winter coats. While convenient, thousands of these plastic microscopic fibers ("microfibers") - which are too small to be caught by a dryer lint trap - are often shed when the clothes are washed, causing them to end up in our waterways and add to plastic pollution in the oceans. "Microfibers are a sub-category of microplastics that originate from items like clothes, carpets, furniture, fishing line and fishing nets, and cigarette butts, " says Nicholas Mallos, director of Ocean Conservancy’s Trash Free Seas® program, "They are essentially any synthetic fiber that is less than 5 millimeters in size." Because nearly 1 million of these fibers are released when polyester fleece is washed, outdoor clothing brand Patagonia has committed to researching microplastic pollution in the ocean. And, a new study shows that sea anemones - which are close relatives of corals - are taking up these microfibers. [on] marine organisms may also be different,"says Dr. Manoela Romanó de Orte, a postdoctoral researcher at the Carnegie Institution for Science and lead author of this study, "We will only be able to understand these differences if we perform studies with microfibers separately from microplastics." Like corals, when anemones become stressed from unusually warm temperatures, they can also become bleached, lose their coloration, and evict the microscopic algae they harbor that provide them with nutrients. 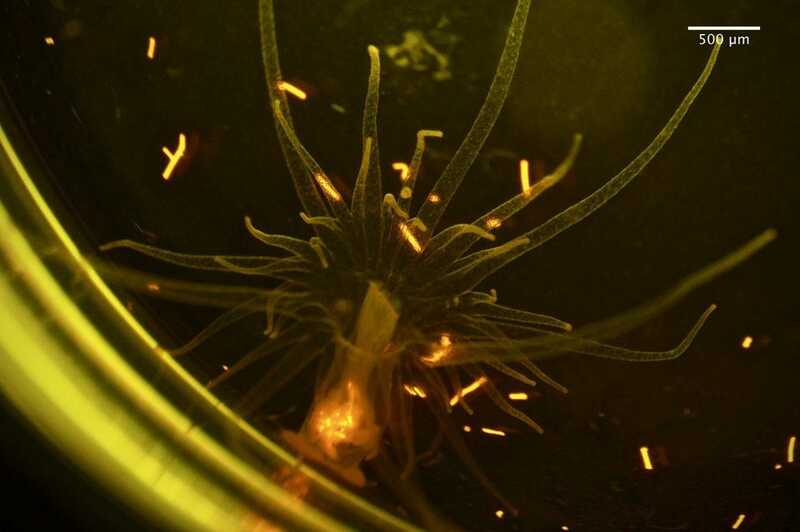 In this study, researchers fed bleached and healthy anemones nylon, polyester, and polypropylene microfibers alone and intermixed with brine shrimp. According to Dr. Romanó de Orte, "Since plastic pollution is not happening alone, but together with other threats such as global climate change, studying the interaction between these two stresses is important to understand the real-world challenges that coral reefs face." When combined with brine shrimp, 80% of bleached and healthy anemones ingested all of the different microfibers. 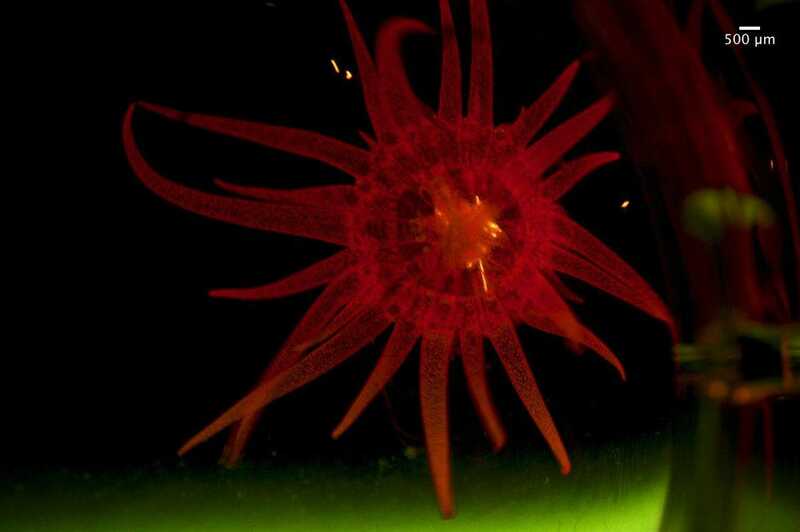 However, once the microfibers were ingested, healthy anemones were able to eject the microfibers from their bodies more quickly than their bleached counterparts. This suggests that warming oceans may reduce anemones' or corals' abilities to expel microfibers from their bodies. "We know that filters on washing machines are highly effective (>80%) at preventing fibers from leaking into the wastewater stream and ultimately the marine environment," says Mallos, "We still need to find ways to divert and capture microfibers outside of the laundry cycle, at the production phase ... and we should also work to make materials that shed less."